Round 9 of Monster Energy Supercross from Daytona definitely lived up to the billing of being the gnarliest track on the circuit. The track was by far the roughest and toughest track that we will see this season. And it showed in the lap times, with every rider averaging a fast lap over the one-minute mark--the first time that has happened this season. So let's get over the lap charts, brought to you by Motion Pro, to see how it all broke down. 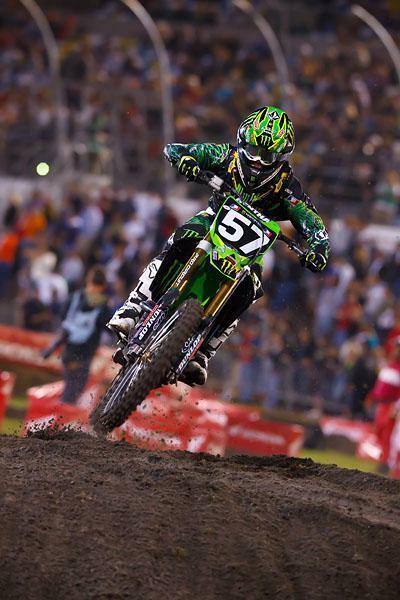 James Stewart was a man on a mission at Daytona. The San Manuel Yamaha rider absolutely laid the wood down at Daytona, setting a fast lap of 1:15.556--almost a full two seconds faster than any other rider. Before you get all worked up and start sputtering about how Stewart crashed his way out of the win...take a deep breath and realize this is Sign of the Laps. We are talking lap times here folks, nothing more. Two in a row for Poto. Ryan Villopoto was there once again to capitalize on a mistake by James Stewart and gap the field en route to his second consecutive victory. Villopoto also set the second fastest lap of the night with a 1:17.306. 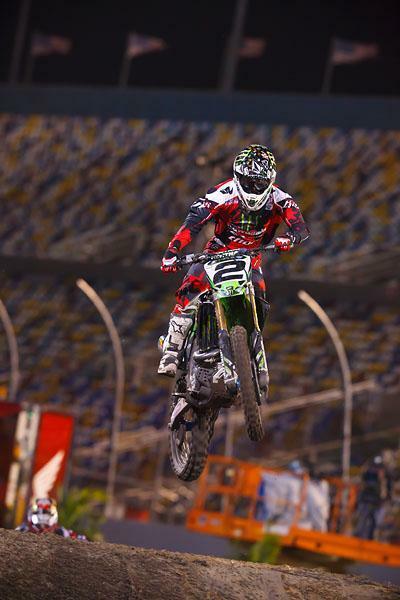 An interesting fact from Daytona--other than all the fast laps being over the one-minute mark--was that a majority of the fast laps were set within the first few laps, with the latest fastest lap coming on lap seven by Davi Millsaps. The track definitely got rougher as the night progressed making it essential to get on it early or get out at Daytona this year. Blake Baggett capped off the Kawasaki sweep of Daytona by notching his second career win (his first came in Dallas last year.) Baggett was in perfect form Saturday as he gapped the field en route to the fastest lap of the night with a 1:18.455. Baggett set the fastest lap of the night en route to his first win of 2011. It was a tough night for privateer Matt Lemoine. Lemoine had a great start to the night and was closing in on fourth when he stalled his bike and dropped back to ninth. Although Lemoine suffered a tough break in Florida, the Texan has shown the speed to contend this year. Lemoine managed to set the fifth fastest lap of the night with a 1:20.058...just in case you were wondering.